We take our most careful and pay much attention to our production procedure in order to achieve the best quality outcome with satisfactory of our customers. At first we have to examine the rice being transported by farmers or other transporters to our rice mill. The examination is done by scientific method and boiling system to find fault with impurity mixtures. Then at the production house, we use the most high technology machine and equipment, the Color Sorter is used in order to separate mixtures out from the processing line automatically. 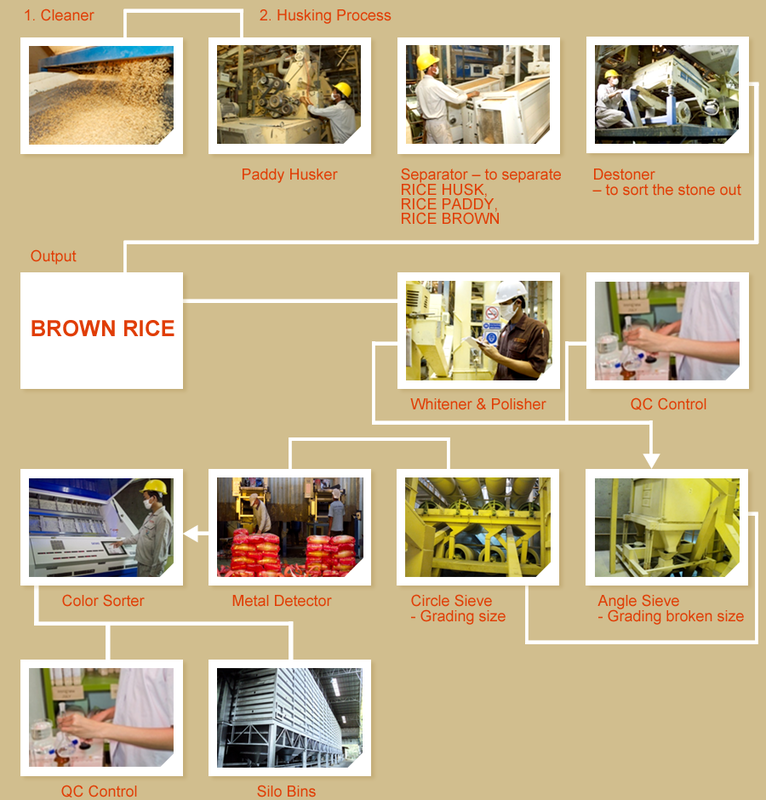 Afterwards, the rice run through the most standard rice mill, paddy rice being extracted and segregated, while the pure rice be re-extracted to remove any remaining mixture like stones, gravel or heavy metals, next the pure rice be polished and turn to be plain prior to be passing sorter for final extracting mixture to be ready for weighing machine and pack in desired package. Quality control will then be finalized prior to classify to storage control, and be ready to be delivered to customers or marketing cycle after all. "We will continue to work to the highest standards of quality and follow our policy of producing and exporting premium Thai rice under the strictest of hygienic processes reaching international standards." Paddy from Silos will be transferred to the milling house. With this process, the paddy will be turned into BROWN RICE and RICE HUSK. The Brown Rice will be passed to the whitener machine to become "White Rice". After that white rice will be moved to polisher machine for shiny and transparent grains, then to the length grader to separate the broken. Copy Right 2012. K.M.C. Inter Rice (2002) Co., Ltd. All RIghts Reserved.